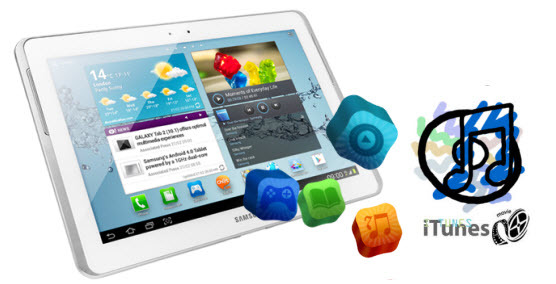 The Samsung Galaxy Tab 2 is considered as one of the most wonderful tablet in the world. It's cool to get one. Maybe you have purchased and download some video and music from the iTunes store, now you prefer to enjoy the iTunes on galaxy tab 2. This guide will show you how to do that. There are several applications that can help you transfer files from iTunes to Galaxy tablet. For example, DoubleTwist . However, you may run into a problem with some music files that purchased from iTunes store are locked by the DRM (Digital Rights Management) protection. Generally, the protected iTunes videos are in .M4V format and the protected iTunes music are in .M4A and .AAC format. It means you cannot play them on your Galaxy Tab 2. So you need to get rid of the DRM protection before you can enjoy the wonderful movie and music on the tablet. How can you get rid of the protection? 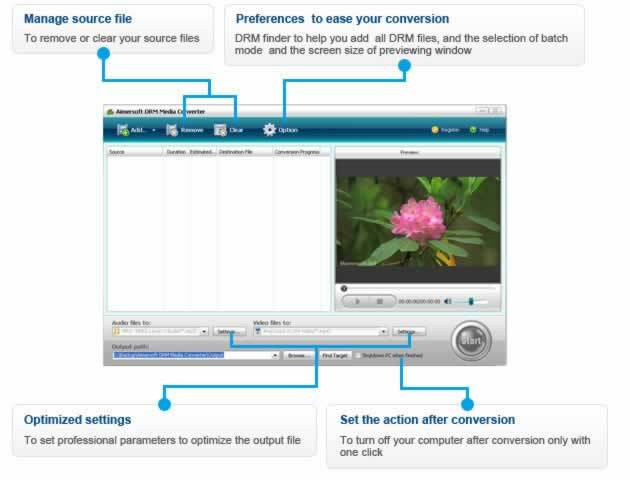 Here we recommend the Aimersoft DRM Converter. It can help you convert iTunes files to Galaxy Tab 2 compatible format with best quality. Of course, it is an excellent tool to remove DRM protection from the iTunes files. First of all, you need to download the software to your computer and install it. With this powerful software, you can move away the DRM protection effortlessly. Note: If you are a Mac user, please download AllMyMusic for Mac to convert audio files, and download AllMyTube for Mac to convert video files. Click "Add" button to import protected iTunes M4V, WMV, AAC, M4A, M4P format files to the converter. Or you can drag the iTunes files that you want to convert to this software directly. You can choose the output format with optimized settings. Also you can select the most common format for the output format. The video we recommend "mp4" format and the audio we recommend "mp3" format. Then set the resolution as 1280×800 or smaller. Don't set the resolution beyond its maximum resolution or the Galaxy Tab 2 can't play it. After setting formats, click "Start" button on the right corner of the main interface to start the iTunes to Galaxy Tab 2 conversion. After the converting is finished, you may click "Find Target" to find the converted files. Then connect your Galaxy Tab 2 with PC through the USB cable. Drag and drop music directly from the iTunes window to the Music folder you made on the Galaxy Tab removable disk. Now, it is your time to enjoy your favorite songs and movies on the Galaxy Tab 2.